With more than 3.7 million annual visitors adding to a population that has grown by almost 10 per cent in the past 12 years, Edinburgh is currently one of the UK’s most in-demand destinations. Finding a little calm amid the bustle of the Royal Mile, the city’s busiest run of streets in the heart of the Old Town, is particularly tricky – unless, of course, you know where to look. Take Dunbar’s Close Garden. Hidden down a dark cobbled alleyway off the Royal Mile towards Canongate, the benches in this 17th-century-style walled garden are a calming place to rest your legs. The garden itself is divided into three neat parterres, all gravel walkways and neatly trimmed shrubbery. A short walk up Calton Road takes you to The Archivists’ Garden, which opened in 2010 and sits between the New and General Register Houses, the homes of Scotland’s national records. To contrast the orderly nature of these institutions, David Mitchell, a curator at the far larger Royal Botanic Garden Edinburgh, conceived the planting in a flowing, organic layout, with specimens chosen for their cultural associations. Elsewhere, Dr Neil’s Garden on the far side of Holyrood Park is an ideal spot for quiet contemplation. Doctors Nancy and Andrew Neil began cultivating this secluded patch on the banks of Duddingston Loch in 1963, often encouraging their patients to tend the garden as part of their recuperation. The Physic Garden, in particular, is a gorgeous circular plot, filled with herbs and roots arranged according to their health benefits. You don’t need to be a horticulture vulture to enjoy a little respite in the heart of the city. Take, for example, the biographical and portraiture library at Scottish National Portrait Gallery. Fitted out in 1891 when the Society of Antiquaries of Scotland shared the same building, it was recently refurbished so that the portrait busts are tastefully picked out by modern top lighting. Book a visit for a relaxing browse of thousands of art catalogues and periodicals dating back to the 19th century. With more than 1.8 million visitors in 2016, Edinburgh’s National Museum of Scotland is the most popular attraction in the country, yet even here one can escape the crowds. While the many exhibitions demand your attention, very few visitors venture up to the museum’s seventh-floor roof terrace. Sculptor Andy Goldsworthy designed the outdoor space in tribute to James Hutton, the 18th-century, Edinburgh-born father of modern biology. A sunken garden is dotted with local specimens, but the real appeal is a spectacular 360-degree view of the skyline from Calton Hill to Arthur’s Seat. Indeed, when the prevailing southwesterly wind whips up, it can be a bracingly beautiful place from which to plot your course around the capital. And while the Edinburgh climate may not make it the obvious place for a day at the seaside, the quiet eastern suburb of Portobello Beach boasts a promenade along two miles of golden sands. Look out for the grand Victorian architecture of the Portobello Swim Centre, complete with an original 1850s Turkish bath, inspired by Scottish diplomat David Urquhart’s trip to Constantinople. Finding a hidden gem in Edinburgh doesn’t always mean avoiding tourist attractions. The Real Mary King’s Close is rightly very popular as it provides theatrical, historical tours of Edinburgh’s “underground city” on the Royal Mile. However, venture a couple of miles south to Gilmerton Cove instead to discover a series of hand-carved passageways and underground chambers that are no less mysterious or intriguing. Various theories abound about the origins of the cave – could it be a smuggler’s hideout or a blacksmith’s folly? Book onto an informative tour to make up your own mind. In a similar vein, while the Old Observatory House is recognisable to anyone who has ascended Calton Hill from the west, the Royal Observatory on Blackford Hill is far less well known. Opened in 1896 thanks to the generosity of the Earl of Crawford, this Victorian observatory remains home to a leading research facility and visitor centre. Look out for dark sky events, as well as the launch of a new programme of weekly astronomy talks that begins on 30 October. The queues at Edinburgh Castle can also be avoided at the far quieter, yet no less compelling destination of Lauriston Castle. The interiors of the original Georgian castle are largely as they were in 1926, in the hands of its last private owner, the wealthy Edwardian widower Mrs Reid. Book a house tour to explore rooms full of beautiful hand-carved furniture, Blue John ornaments and 18th-century ceramics. Outside, the Edinburgh Kyoto Friendship Garden opened in 2002 to mark the twinning of the two cities. A 10-minute walk to the east of Lauriston Castle brings you to Cramond Falls, a beautiful and secluded waterfall on the River Almond just before it opens out into the Firth of Forth. 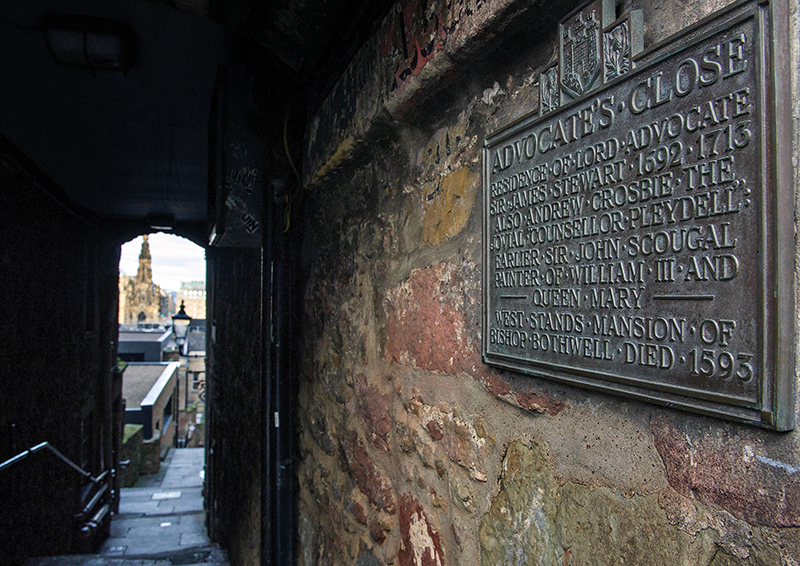 Following a tasteful restoration of Advocate’s Close, this narrow Old Town back street was named Scotland’s “best building” in 2014. Hidden down here in an old Victorian pump house is The Devil’s Advocate, an inventive double-height bar with mezzanine restaurant level. The seasonal cocktail menu draws inspiration from Greek mythology, while the drinks shelves are laden with more than 300 whiskies – try “A Tour of Scotland”, a flight of five favourite “nips” from Lowland to Speyside. Over in New Town, another cobbled lane hides the romantic bistro Cafe St Honoré. Despite the Gallic influences, the food is proudly prepared with local produce so expect delicacies like Belhaven mackerel and Blacketyside Farm strawberries in the plats du jour. For a truly hidden gem, head to Panda & Sons on Queen Street – and don’t be fooled by the bright-red barbershop façade. While the window promises haircuts and shaves for 25 cents a piece, this is no hairdresser, but rather a front for a Prohibition-style speakeasy hidden downstairs behind a fake bookcase. Talking of books, Harry Potter fans regularly make a pilgrimage to The Elephant House, the Marshall Street café in which JK Rowling penned much of her early novels. Scottish crime author Ian Rankin was also a regular here. You can escape the queues and raise a toast to his most famous creation, Inspector Rebus, at The Oxford Bar instead. A favourite haunt of Rankin since the mid-1980s, “The Ox” was also written into many of his novels. As the author puts it, the bar is “Edinburgh in microcosm – a city that seems very public and yet very private at the same time”.